AU’s investment in the Paradigm Project will provide efficient wood-burning stoves to African women, helping communities and the environment. American University recently took a major step towards achieving its goal of climate neutrality by 2020 by offsetting emissions from study abroad-related air travel. Recognizing that certain emissions sources, such as air travel emissions, cannot be eliminated given our current technological limitations, and because they are necessary for the university to fulfill its mission, the Office of Sustainability announced that AU will begin to invest in a portfolio of offsets that will be aligned to certain sources of emissions. Specifically, to offset emissions from study abroad-related travel, AU will invest in the Paradigm Project, an endeavor that benefits communities in Africa by empowering women, providing jobs for women, and reducing greenhouse gas emissions through reduced deforestation. 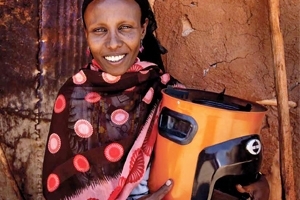 AU's investment in the carbon offsets from this project enables the Paradigm Project to offer financial assistance to families in Kenya to help pay for wood-burning cook stoves as well as to help expand the Paradigm Project's distribution channels. The stoves are designed to burn wood efficiently thereby reducing the amount of firewood the women in the community will need to collect as well as improving indoor air quality for families. According to Director of Sustainability Programs Megan Litke, "As we move closer to our goal of climate neutrality, we will continue to use offsets to complement emissions that cannot be mitigated easily through reduction or new technologies. Study abroad is the perfect place to start, AU's program connects our students with communities around the world and the Paradigm Project in Kenya provides an opportunity for us to further our contributions to one of our premiere study abroad locations while bringing real examples of sustainable development to our classrooms." Sara Dumont, the Executive Director of the AU Abroad program added, "We are thrilled that AU's Office of Sustainability Programs has not only identified a mechanism for offsetting emissions from study abroad-related travel, but also that the chosen project has a Kenyan focus. AU established its Nairobi Center more than 13 years ago and it has developed into one of our most important sites abroad, serving hundreds of AU students and developing strong connections with Kenyan communities. The Paradigm Project will further strengthen these connections for AU." Every year, nearly 1,000 AU students participate in programs around the world. Emissions from air travel for these programs are included in the calculations of the university's greenhouse gas (GHG) emissions along with emissions from buildings, commuting, and other campus sources. Previously, AU achieved a 53 percent reduction in GHG emissions from the baseline established in 2005. Further progress has been made from the use of 100 percent renewable electricity including half of the university's electricity now being derived from the Capital Partners Solar Project, improved energy efficiency across campus, and expanded use of alternative transit options for commuting. The Paradigm Project develops distribution networks that serve customers at the base of the economic pyramid. They sell efficient stoves, water filters, solar-powered lights, and other socially beneficial products, and sell carbon credits generated from their use to fund growth and keep product pricing low.